Alienware may be the brand that is synonymous with gaming laptops but not all of us can afford one, so Dell has introduced the Grange of laptops that reduce the cost of entry for gaming laptops while retaining the superb design and build quality found on other Dell and Alienware laptops. The range includes the G3 and G5 models with the G3 coming in both 15-inch and 17-inch models while the G5 has just a 15-inch model. The cheapest option you can get is the G3 within i5-8300H and GeForce GTX 1050 costing only £698.99 (currently). The G5 range starts at £748.99 with the i5-8300H and GTX 1050. Looking just at the specs and price, the G3 is the better buy as it is both cheaper and has a better hard drive. The model I have been sent to review is the G5 with i5-8300H and a GeForce GTX 1060 6GB which currently costs £899. This appears to be very well priced with the only other laptop I can find at this price being the Lenovo Legion Y52015.6″ but this uses an older i5 7300HQ and the 3GB GTX 1060. You would have to pay an additional £100 for the ASUS TUF FX504GM though this does have a better CPU and display. The closest equivalent in the Alienware range is the M15 with GeForce GTX 1060 which will set you back £1599 so it is quite a big difference in price. The Alienware does feature a better CPU, bigger NVME, better display while also being slimmer and lighter, so there is a justification for this pricing. The G5 can’t compete with the likes of the Alienware range in terms of overall build and design. The most notable difference is the weight which is 600g more, or around 28% heavier, this does make it a little heavy compared to the more expensive GTX 1060 options on the market. However, it is the same weight as the similarly priced Acer Nitro 5. Overall though, I find this a good size and weight for a gaming laptop, it is not back breaking like some of the 17-inch models, you can comfortably use it on your lap, or transport it in a backpack occasionally. I just wouldn’t recommend walking around with it all day frequently. While it is bigger than some of the other laptops, if you have bought or used a gaming laptop in the past 5 years or so, you will find it very thin. This is thanks to the NVIDIA Max Q Design that is now used which allows this laptop to be relatively slender compared to previous generations. 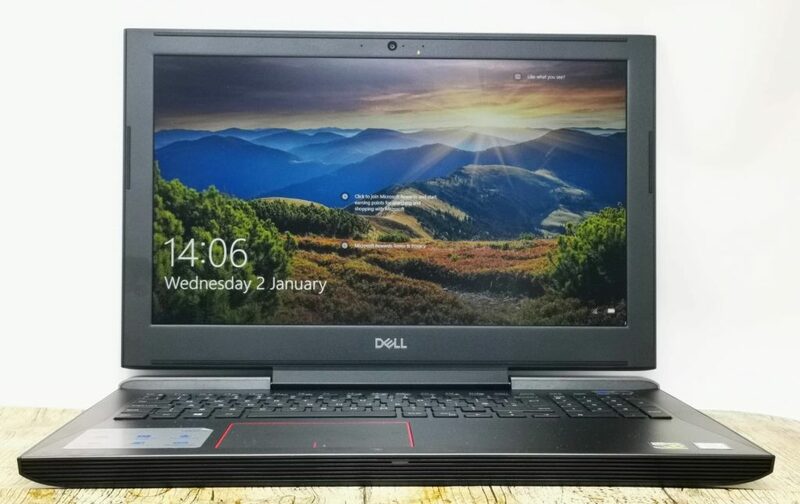 Dell has also reduced the quality of materials to hit that low price point, it is by no means bad, but it is mostly just a black plastic laptop. You have a few gamer orientated design flourishes such as the grey vents on the front and rear of the laptop but overall this doesn’t exactly scream out as being a gaming laptop, which to be honest, I quite like. Opening up the laptop reveals some pretty chunky bezels, which to be fair is something even the Alienware 13 featured last year, but with the boom in bezel-less phones, and the fantastic displays on the Dell XPS models, this does look a little dated. You generally get a good selection of ports with gaming PCs because they are chunky and can fit them. This is no exception you get an RJ45 port, one USB 3.1 port with always-on charging and a 2-in-1 SD card slot, while the right side features an HDMI 2.0 port, one Thunderbolt 3 port, two USB 3.1 ports and a headphone jack. Due to the power requirements of gaming laptops, you will still need to use a proprietary power adaptor rather than USB-C that’s becoming increasingly common with ultra-portables. The display is one of the main areas Dell has cut back to reduce the cost of this laptop. Again, it is not so much that it is bad, it is just not as good as laptops costing several hundred more. The 15.6-inch FHD (1920×1080) IPS display runs at 60hz and features an anti-glare coating. The overall brightness is quite low as was the contrast ratio. Playing games in with a lot of dark scenes can be a little difficult unless you crank up the brightness and/or tweak the gamma settings. Overall it was a little lacklustre, but not terrible, and I think it provided more than adequate performance for its target market of gamers on a budget. As you would expect for a lower priced gaming laptop, there are no customisable RGB elements here. The keyboard is backlit which is all I want really. You get a full-sized keyboard with number pad. I didn’t have another Dell laptop to hand when writing this but I feel like the chicklet keys had less travel than other laptops in the range. It was good to type on for long periods of time, just not as good as the XPS range. The touchpad is slightly off centre for the width of the laptop but it is aligned centrally with the keyboard and doesn’t get in the way of WASD too much. It is quick and accurate plus there is a proper left and right clicks which is makes working and gaming a little easier. The laptop also features a fingerprint scanner built into the power button, this is something typically seen on more expensive laptops such as the Huawei Matebook Pro X, and it is a welcome addition here, making logging in much quicker. The performance of a gaming laptop is the most important aspect of it, and this is where the G5 gets a chance to really shine. From my limited research, I think this offers one of the best price-performance ratios on the market and for that reason alone makes this a great laptop. It achieved 3715 in TimeSpy making this 88% higher than the Acer I reviewed recently. Admittedly the Acer is £200 cheaper, and still a superb laptop, but this shows what spending a little more can achieve. In this case a 33% larger investment yields 88% more performance. Similarly, with PCMark 10 the Dell G5 gets 5483 which is a 53% improvement over the Acer. 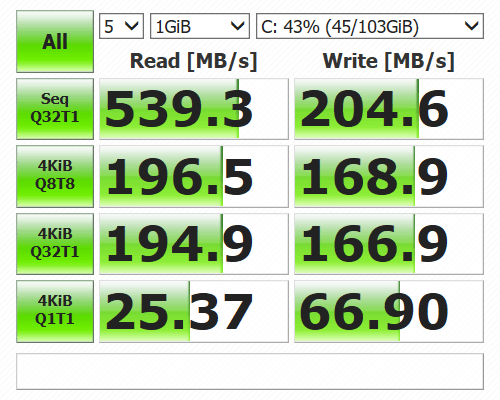 The G5 is listed as having a 128GB M.2 PCIe NVMe Solid State Drive but when I ran CrystalDiskMark it performed at SATA speeds not NVMe and Speccy indicates it is a 119GB SK Hynix SC3111 SATA drive. With this being an affordable gaming PC this makes a lot more sense than NVMe but you should be aware of it when buying. In terms of gaming, all these benchmarks translate into an extremely competent gaming PC especially at the 60Hz 1080p the display is restricted to. I played several games including Far Cry 5, The Witcher 3, GTA V, and Fortnite and this was able to handle Ultra settings with them all comfortably. During my testing, none of them dropped below 30FPS in Ultra with GTAV and Fortnite constantly staying over 60FPS. This should be able to comfortably handle any game running at high settings. Battery life is never amazing on gaming laptops due to the power-intensive hardware used in them, however, the G5 does better than average compared to others. I was comfortably able to get through a mornings worth of work without worrying about the battery dying on me. This was approximately 5 hours of office-based work such as email, chrome, and MS office. Gaming will naturally drain the battery much quicker, and you will be lucky to get 3 hours gaming out of this. I am a stickler for noise, and in recent reviews, I always talk about the noise of a laptop so I will just dedicate a section to it now. The fans spin up under all loads, but with a light load it is barely audible. In my reasonably quiet home office, I had to lift up the laptop and put my ear next to the base to make sure it was making a noise. Heavy load and gaming the fans are very audible, running PCMark10 I could easily hear them over music. However, it isn’t excessively loud, certainly quieter than some gaming PCs I have reviewed and the audio profile is not too annoying with the fans not being too high pitched. While the G5 can’t compete with other similarly specced laptops in some areas, it outshines most of the competition regarding price. Sadly, you always have to make some sacrifices in order to save money but I don’t feel like any of the cost-cutting measures here ruin this laptop. The G5 offers a similar overall design and build to the Acer Nitro 5, while it does cost £200 more, you are getting a significant improvement in overall performance. 3DMark Time Spy scores of this laptop are 88% higher and the 6GB available to the Nvidia GeForce GTX 1060 Max-Q will allow this to run much more demanding games than the Acer. For the price, I think this is a superb laptop, and one of the best options on the market right now for a cost-conscious gamer. Not three, not four, but five Galaxy S10 models coming?